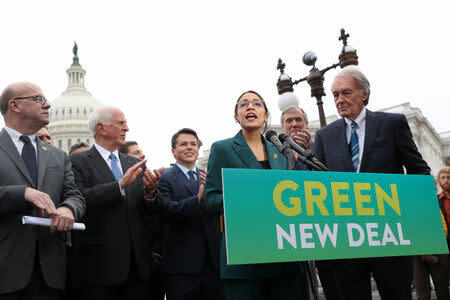 WASHINGTON (Reuters) - Democrats on Thursday laid out a "Green New Deal" that would eliminate U.S. greenhouse gas emissions within a decade, an effort to make climate change a central issue in the 2020 presidential race. "Today is the day that we choose to assert ourselves as a global leader in transitioning to 100 percent renewable energy and charting that path,” Ocasio-Cortez told reporters. Ocasio-Cortez said she will immediately begin to work on legislation that would "fully flesh out the projects involved in the Green New Deal." "It’s a socialist manifesto that lays out a laundry list of government giveaways, including guaranteed food, housing, college, & economic security even for those who refuse to work," Republican Senator John Barrasso, chair of the Senate Environment and Public Works committee, said on Twitter. "We... need to be sure that workers currently employed in fossil fuel industries have higher-wages and better jobs available to them to be able to make this transition, and a federal jobs guarantee ensures that no worker is left behind," according to a summary of the plan. "They will not accept vague endorsements," he said. "The difference between 2009 and today is the movement that has now been built," he said. "This is going enter the 2020 election cycle as one of the top two or three issues for every candidate on both sides."